The taste of Cuban-style cigars, like the Padron serie 1926 cigars, truly allows for one of the finest experiences. Padron's cigars are handmade and combine the heritage of Cuban cigar making with new and traditional blended flavors. Since 1964, Padron has been making these classic celebrations of a rich, smooth taste. The celebration of Jose O. Padron's 75th birthday produced one of the finest cigars for Padron, the 1926 series. Unveiled in 2002, the tobacco in this series aged for over five years before being wrapped. In total, seven different cigars make up this package, including all shapes and sizes, from rounded to torpedo. The sampler package contains four cigars, one each of the No. 1, No. 2 Belicoso, No. 6, and No. 9 with either natural or maduro wrappers. The 80 Years is the largest in the series, a 54 by 6 3/4 cigar, top rated by Cigar Aficionado in 2007 and 2008, with a near 100 score. The best part about the 1926 is the time that goes into each of the cigars. The 40th Anniversary Padron serie 1926 cigar comes in a very limited edition numbered hand painted and carved humidor with slotted shelves complete with magnetic closure, containing 40 natural or maduro cigars with a size of 54 by 6 ½. This cigar is also packaged in a regular box of 20 cigars. This cigar received recognition for being named the cigar of the year by Cigar Aficionado magazine 2004 with a 93 rating. 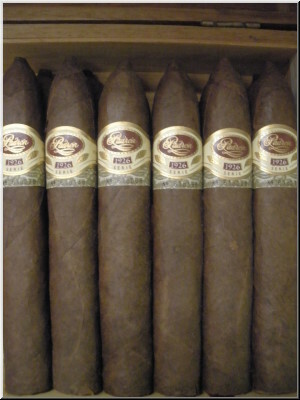 Aged for five years, the tobacco leaves are perfectly blended, and Padron has a reputation for high quality in every cigar, which shows in the 1926 serie. Rich Cuban heritage presents in every note from this cigar. The Padron serie 1926 offers a complex taste yet balanced experience, a full-bodied blend of aromatic tobacco leaves and a double band design that sets the 1926 cigars apart from others in the family's fine collection. The cigars also come in a special anniversary box that stores and keeps the cigars refreshing for years after being pressed.